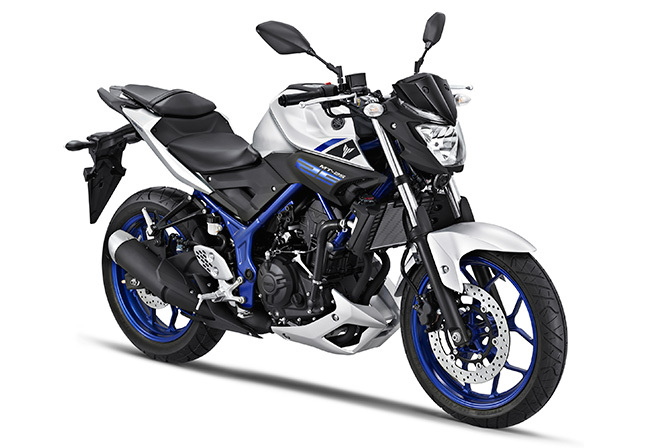 Yamaha Motor Launches New 'MT' Series in Indonesia, Platform Model Delivering Both Superior Handling and Cost-performance - News Releases | Yamaha Motor Co., Ltd.
IWATA, June 8, 2015 – Yamaha Motor Co., Ltd (Tokyo: 7272) announced today that the new 'MT-25' sports model from the 'MT' series, featuring a 250cc liquid-cooled in-line two-cylinder engine, will go on sale in Indonesia from June 2015. Manufacturing and sales of the new model will be carried out by Yamaha Motor's group company, PT. Yamaha Indonesia Motor Manufacturing (YIMM). The 'MT-25' brings the sporty feeling that is enjoyed in the everyday speed ranges of the 'MT-09' and 'MT-07' (launched principally in developed markets last year) and the character of the 'MT' series to the 250cc class. Moreover, through its development based on the platform (including engine, frame etc.) of the 'YZF-R25', which has already won high praise in the ASEAN and developed markets, it delivers both superior handling and cost-performance. The development concept is the 'street cheetah', which can nimbly cut through the urban jungle and take the lead in the traffic flow. In recent years, the popularity of sports models has continued to increase in Indonesia, and last year Yamaha Motor launched new products such as the 'YZF-R15' and 'YZF-R25' designed for those who love the road racing scene. Along with these high-value-added models, the new 'MT-25' will contribute to further heightening the sporting image of the Yamaha brand, and expanding Yamaha Motor's sales throughout the overall market. Moreover, as a global model charged with 'expanding business scale', the future launch of the 'MT-25' is planned for many countries around the world, including developed markets.